Hello! Very excited to greet you all! I began researching vehicles to turn into a camper and finally decided a short bus would be the best vehicle to suit my needs. I purchased a 2001 Chevrolet with 105k on a 6.5L diesel and a 5 window Corbeil body. I've had a mechanic check it out and it's in great condition throughout. It was posted for $3500 and I got it for 3k, which at the time I thought was an unbelievable deal, but I've seen others on here that have gotten similar or even better deals. For the DIY-minded, I think skoolies offer a fantastic bang for the buck. It's definitely one of the smallest buses I've seen on here, which is perfect for me, as I will be travelling mostly alone. I was originally looking at a cargo van, so it's still much roomier than my original vision. I also like that it is only a single tire in the rear, and can park in a single spot at just over 19'. I am currently in community college, and am planning to only enroll in online classes for the fall semester, so I am planning to spend the late summer and fall(atleast) travelling around the country, seeing sights and visiting old friends. 1. I would like to run "1/2 tongue and groove aromatic cedar panelling down the sides and also on the ceiling. How much of the interior should I remove? The ceiling is actually a bit shorter than I am, so I figured if I remove it, it might save me "1/4-1/2 (every bit counts) or should I just put the cedar on top of the existing ceiling? Also, does anyone have any installation tips? I've worked with cedar before just never had to fasten it to thin strips to metal on something that will be moving around. 2. Below the windows on the sides the siding is attached by rivets. Are they worth removing? It looks like I'll really have to rip the whole bus apart to remove the panels, especially the lower one. I was thinking I would just put insulation and a thin sheet of plywood and then the cedar to cover it up. 3. I've taken the seats out and have decided to definitely remove the rubber and hardwood too. I want to replace it with something that is real wood. I'm thinking 1/2" plywood with 1/2" maple on top? Like I said, headroom is at a premium so I'm also not opposed to just getting a nice piece of oak plywood and using that as my floor, anyone done that? I guess that's it for now, I hope you all like my bus! I really enjoy the positive attitude of skoolie owners and the people in this forum and I think it probably played a role in me deciding to go with a bus. I'll post pics and I'm sure more questions as I go. Thanks for the input! Nice bus! Look like to be in an excellent shape, no rust or any visible damage. Can't help you really because i'm planning to buy a bus like this with the same dimension soon but good luck in your project! I just spent a lot of time getting a ton of rivets out of my bus. There was all kinds of funky grossness behind the paneling though and the the insulation that was there was a joke. There are all kinds of opinions on this. I guess it just depends on your tastes and needs. I know I'm glad to have mine truly gutted so that I can better insulate and finish it. Whatever route you choose just make sure you're happy with it. I have a Shorty also, mine is dual axle G30 with a 350 Chevy. I don't have a bus yet, but I want one exactly like yours. In my case however it would be for full time living, and commuting to college. Park at wal-mart or k-mart or something at night, drive it to the college at day. Pretty easy with a shortie. Oh; However you ever thought of adding a loft to your skoolie by raising the roof? Thanks! I plan to live in mine full time too, but I'm starting with a tour of the US in the fall. Raising the roof is a little more involved than I would like to get, and if I did, I would only want to raise it about 2-3" which seems like a waste, but I have came up with a solution. I think I am going to have a custom skylight made and install it between the 2nd and 4th ribs in the ceiling. I plan on it being about 5'x2'4". This should give me enough room to stand and also I think I'll really enjoy the extra light and ventilation. Anyone done anything like this? I'll only be cutting through one rib so I don't think it will harm the structural integrity of the bus too much hopefully. A big plus one on that! I'd be really curious to see what you end up doing. 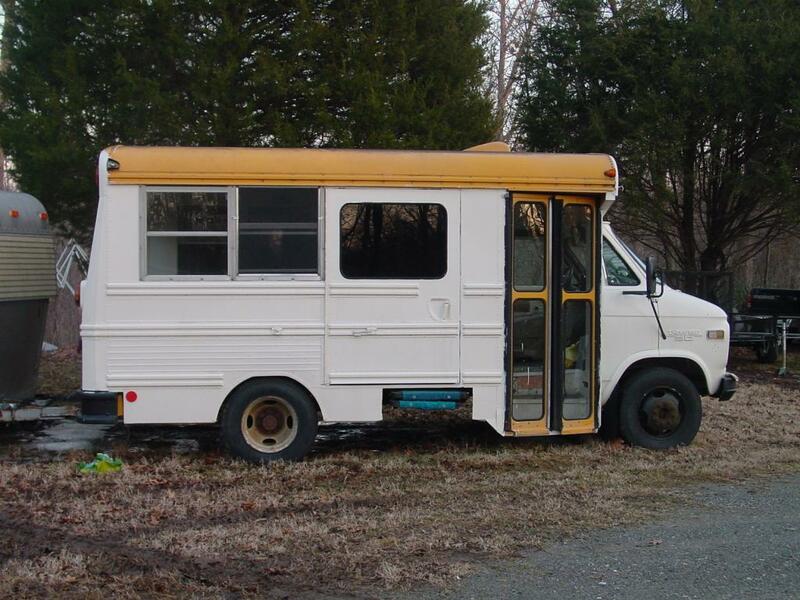 I'm seriously considering this little bus https://newyork.craigslist.org/lgi/cto/5340039137.html And it looks like it's even smaller than yours. But I was definitely thinking of putting in a skylight (thank you for the link to that custom company! ), and a fantastic fan as well. I don't think the roof ac is going to be useful to me since I think it only runs when the bus is running. I'd also be really curious to see what you end up doing with your insulation. I'm not too experienced with anything like that, except insulation in my house. And I wonder if ice shield or sips might be options instead of say wool, or fiberglass. I hate that stuff. Plus, I may keep the onboard heater in this bus if I do end up getting it. Or may even get a dickinson marine stove. So not sure it would need insulation then. Looking forward to following your project, and to hearing what others might have to say on these ideas. Love the community here. Amazingly helpful folks, and true enthusiasts. Oh and I forgot to ask, has anyone here had experience with keeping some of the seats and then reconfiguring them in some way?